Pictured left to right: Naema Mohamed, Shenai Ellis, pilot Andy Ryder and Thelonious Parekh Porter. Wales Air Ambulance visits Mount Stuart Primary School, Cardiff, Wales, UK, February 28th 2017. Picture by Mark Hawkins for Wales Air Ambulance. Wales Air Ambulance landed at Mount Stuart School in Cardiff Bay to provide an educational workshop about how to call 999. Mount Stuart School is the first of several primary schools across Wales to receive the special assembly from Wales Air Ambulance, the only air ambulance dedicated to serving the people of Wales. 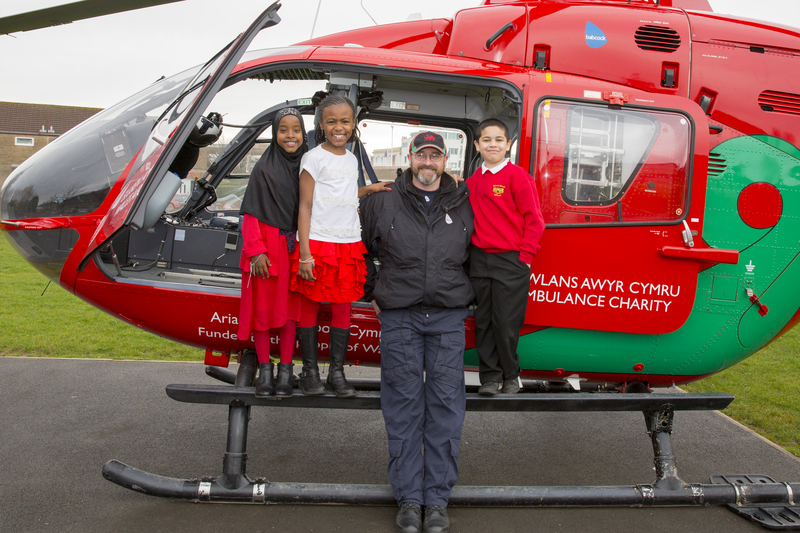 Having helped some of Wales’ youngest patients through its specialist division, the Children’s Wales Air Ambulance, the charity wanted to make sure that young people know what to do in an emergency. After landing the helicopter on the school playing field, staff from the Wales Air Ambulance charity taught more than 200 children aged between eight and eleven about what to do in an emergency. Annie Lawrie, Wales Air Ambulance’s community coordinator, told pupils when to call 999 by going through different scenarios, and what to expect when talking to an emergency dispatcher, including knowing the address of the incident and whether or not the injured person is breathing. Angela Hughes, chief executive of the Wales Air Ambulance said: “For many of us, even as adults, being faced with an emergency can be incredibly frightening and dialling ‘999’ for the first time can be quite scary and confusing. We wanted to take some of that initial fear and uncertainty out of the situation and educate children when and how to call for help, should they ever need to. As well as the workshop, pilot Andy Ryder showed the children some of the lifesaving medical equipment used on board including a ventilator to help critically injured patients breathe and a specialist incubator for vulnerable babies. The Children’s Wales Air Ambulance, the specialist division of the Wales Air Ambulance charity is the only air ambulance service dedicated to serving the needs of its youngest patients in Wales during their most urgent hour. Its four bases means its aircraft can reach anywhere in the country within 20 minutes. Last year, in partnership with NHS Wales, the organisation introduced new, on-board incubators for vulnerable babies to transport them to hospital quickly using some of the best equipment available in the UK. Wales Air Ambulance is also introducing a new fleet of helicopters this year and has recently extended its flying hours on its fourth helicopter from five to seven days a week. The charity relies on donations to raise the £6.5 million needed each year to fly its helicopters over Wales.